Summer is the time most teenagers come to the pediatrician’s office for their annual health exams. Here are 6 tips to help make the best of the time you spend with your doctor. 1. Make an appointment. Now. Teens are a dynamic animal. And fortunately, most are very healthy. But healthy kids need doctors, too. Subtle changes in physical exam, measurements, and lifestyle can be concerning issues to a trained pediatrician’s eye. And if teens are not routinely seen by a provider, opportunities for easy correction and treatment can be lost. A pediatrician is expertly trained to provide a complete physical exam for your teen child. Our job is to be sure that your child’s global health is optimal, physically and mentally. We specialize in the growth and development of teens, as well as discuss the risks and challenges of their age. Most importantly, seeing healthy teens and their families is when pediatricians can make the biggest relationship impacts. Well child visits are instrumental in developing a working partnership with someone in the health care field that can be your family’s partner and advocate should challenges or illness arise. And, we love to see you. Please make an appointment for your teen to be seen. Since teens are generally healthy creatures, parents and kids often have absolutely NO concerns about their child’s health. GREAT! These visits can be used to review healthy habits, safe living practices, and look at vacation photos. I love those check-ups. Your teen’s appointment is, however, the only time we will likely see each other this year, so please take a minute to think about any issues you would like to discuss. In fact, make a list. Then, remember to bring the list with you to the appointment. 3. If you have significant issues to discuss, consider sending an email or letter giving some details prior to your appointment. Issues such as depression, weight gain or loss, menstrual concerns, ADHD, and headaches much more effectively addressed if your provider has had some extra time and some extra history prior to the appointment. If you know that you have a significant concern to discuss, please let the person who is making your teen’s appointment know. This is to allow for extra time, if needed. In addition, ask the scheduler if you would be able to send a note to the physician prior to the appointment. This will optimize our time together. 4. Have the parent’s section of camp forms, health forms, and athletic participation forms completed. 5. Prepare to spend some time apart. After talking with a patient with his or her family, pediatricians often speak with teens privately. It allows an opportunity for us to get to know each patient on a more personal level, without parental interruption. In addition, this allows your teen to “practice” talking with a physician – a very important life skill. The goal of this time is to repeat and reinforce the healthy habits you are already discussing with your teen. The more we know about your family, the better this is accomplished. In addition, private conversations begin establishing a foundation of trust with each patient. As your teen’s trust with a physician grows, it is easier for them to have honest and open dialog about potential health risks. In pediatrics, the conversations with teens are confidential and protected. Providers are obligated to share information with parents in defined situations, such as patients who are at risk of harming themselves or others. The recommendations from the vaccine advisory boards are always changing. Vaccines are a very important way of protecting your teen from significant, deadly diseases. Teens are getting protected from chicken pox, meningitis, tetanus, pertussis, hepatitis, and human papilloma virus with some of today vaccines. Have a great summer, and a great checkup with your pediatrician! Why does my child need to have a physical exam every year? What is it, exactly, that makes them such a necessary part of pediatric medical care? One obvious answer is that these exams are required by one authority or another. Schools require physicals at certain grade levels, as defined by each state’s education law. Participation in school sports, in most states, also requires an examination and health history review, at least every twelve months (if not more often.) Summer camps, employment and working papers and other extra-curricular programs may also demand a physical exam for participation. The value of these exams is clear: If you want to participate, you must have an exam. Outside of these mandated exams, however, why do we do annual exams when we most often do not find any physical abnormality? Abnormalities are, fortunately, rare in the pediatric population. But hernias, tumors, heart disease, abnormal growth patterns suggesting inflammatory bowel disease or endocrine abnormalities—they all do occur in pediatrics, and I have found all of them, more than once, during my career. Sure, these things would eventually manifest themselves, and prompt a visit for evaluation, but with regular examinations, they can often be found earlier, before they have had a chance to cause significant distress or dysfunction. Poor eating habits are all too common in children today. Obesity rates continue to rise, and while this may not cause an immediate health problem, difficulties are ahead for the child who does not bring his or her obesity under control. The opposite problem is also increasingly common: Eating disorders manifest themselves in adolescence, sometimes as early as nine or ten years of age, with anorexia and bulimia. These, too, can have life-long effects on the health of a child, and often the manifestations will be apparent on a regular annual exam well before severe wasting and weight loss which would otherwise bring a child to medical attention. Both obesity and eating disorders are very difficult to treat, but early diagnosis and intervention may make this treatment process easier. These are conditions which can have a very significant effect on a child’s well-being, yet not be manifested in a way which calls the parents’ attention to them. Depression, anxiety, peer relationship problems and ADHD may be having a major impact on a child’s life, and yet not be obvious to those closest to that child. These problems may be picked up simply by observing a child’s demeanor, or during the confidential discussion that we like to have with our patients as soon as they are ready and comfortable to do so. Even though we will not violate a child’s confidence, we can often help to provide a way for a child to discuss troubling issues with his or her parents, and enable the child to see that there are adults available to help him or her through any difficult times. Finally, the annual exam gives the pediatrician a chance to address behaviors in the adolescent which may pose significant risks to health or well-being. Sexual behavior and substance abuse problems are questions we try to address with our patients. We hope to be able to provide guidance as the adolescent navigates through the minefields which are a normal part of growing up. 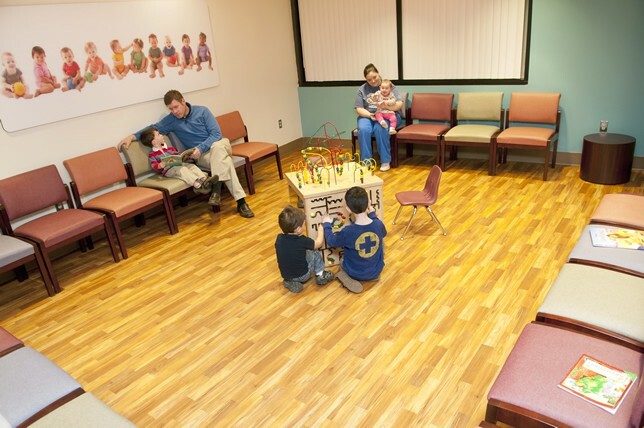 One of the best things about pediatrics is the opportunity that we pediatricians have to know your child on a long-term basis, from infancy through young adulthood, and to watch that child grow and progress through many stages of life. Besides the enjoyment that many of us derive from this type of relationship, we also have the chance to monitor this growth and development, and be aware of any difficulties which may be occurring along the way. The annual physical exam gives us a chance to touch base with your child, and observe and monitor for any potentially harmful deviations from the normal developmental path. It gives us a chance as well to reassure both the child and the parent when things are going well, and suggest intervention when they are not. My colleague Dr. Richard Lander has discussed why your child would be better served by seeking medical care in your pediatrician’s office rather than in a retail-based clinic. While many of these clinics may even claim to do “physical examinations,” and may seem to be very convenient in order to get that physical for the school sports team, these clinics do not have your child’s history at hand, may not have his or her immunization record available in order to provide any needed immunizations, and do not have the long history that many of us have with our patients. While they may be able to check off the proper box to qualify your child to play a sport, that clearance is only a small part of the value of the annual physical exam, as provided at your child’s medical home, your pediatrician’s office.